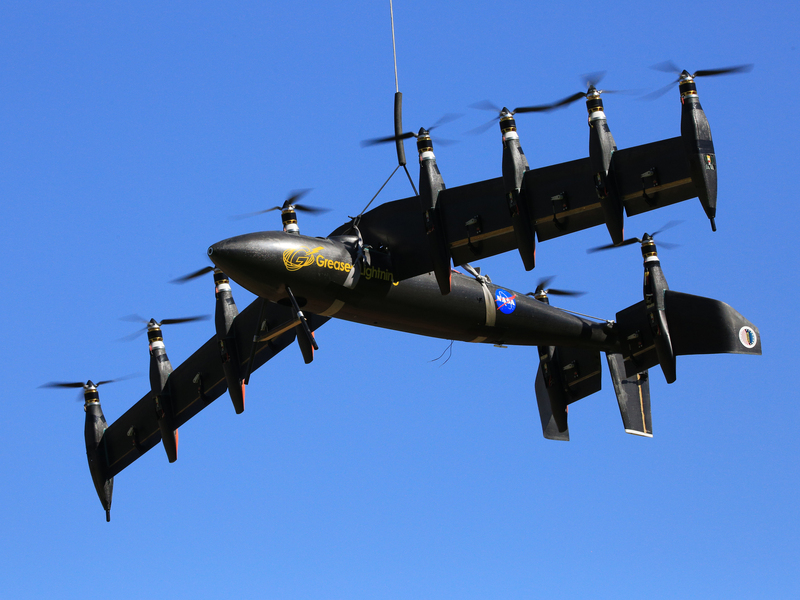 Engineers in NASA have finally succeeded in flying an unmanned aircraft that is a mix between a plane and a helicopter. The new aircraft can hover and land like a helicopter and flies horizontally like a plane. The plane was created by the team using a combo of 10 engines on tilted wings to achieve the characteristics of a helicopter. The vertical and horizontal flight was tested during recent test flights near Langley Research Centre in the US, the prototype is called Greased Lightning or abbreviated to GL-10 was successful in both flight patterns. An aircraft that can accomplish both flights easily, flying off vertically and then be able to cover long distances at high speeds like a fixed wing airplane, has a wide range of uses from military operations to search and rescue and much more. The basic need for a long runway, as normally would be required by a fixed wing plane, is eliminated and thus this invention is very powerful in nature. The easiest way to make such an aircraft would be by using propellers that tilt when needed, creating first the lift needed to get the plane off the ground and then tilting at a right angle to create thrust that would generate speed for the horizontal flight. But this isn’t what the team at NASA did; they developed a new system that would be more aerodynamic, starting their work with foam models and then eventually shifting to fiber glass ones the team built more than 10 prototypes that were tested thoroughly. Right now the GL-10 has a wingspan of 3 metres and a takeoff weight of approximately 28kg; there are 4 engines on each wing and 2 on the tail. The researchers are eventually working on something that would enable the aircraft to reach a wingspan of 6 metres. While NASA’s main role may be in space they also provide us with efficient air-flight technology let’s hope this plane exceeds expectations and they make the small personal air vehicle too.